Enrique of Malacca was a native of the Malay Archipelago. Also known as Henry the Black, he was Ferdinand Magellan’s personal servant and interpreter. He had been reportedly captured by Sumatran slavers from his home islands. 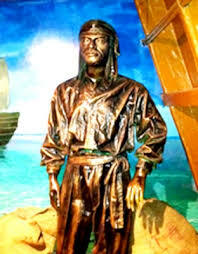 In 1511 he was purchased by Ferdinand Magellan in a Malaccan slave market and baptized as Henrique (spanish Enrique), (his original name is not recorded). 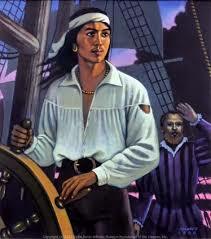 Thereafter he worked as a personal slave and interpreter, accompanying Magellan back to Europe, and onwards on Magellan’s famous search for a westward passage to the Pacific Ocean. He is simply called Enrique on the ship’s muster roll, and Henrich in Pigafetta’s account of the expedition. If a loose definition of circumnavigation (ie, not returning to the exact same spot), then Enrique has an undisputed claim to being the first circumnavigator. He made the first known cultural circumnavigation, travelling around the world until he reached people who spoke his language. He (and Magellan) may also have crossed every meridian — that is he crossed every line of longitude, or circumnavigated the poles.